The Wrong Century: Wedding gift! 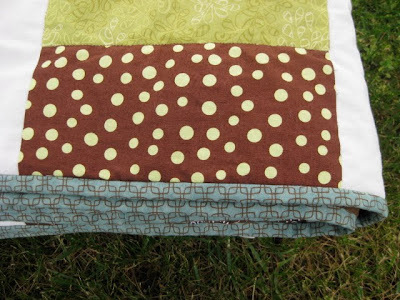 A QUILT! As you should probably realize by now, I'm all about giving people homemade gifts! Christmas, weddings, babies, birthdays and unbirthdays too! Really, any day is a good day for a homemade gift. But special occasions are more fun! So when I got the invite to this very awesome girl's wedding, I knew I was going to have to make her something pretty special! Really special! So since a friend of mine has been offering to teach me how to quilt, I figured this was a great time to learn how! And I have to say it turned out pretty nice for a first quilt! I have to say right off that quilting is very, very different from knitting. It requires a whole other set of skills. I knew from the very first task that I was WAY out of my element. When knitting the first thing you do is choose a pattern and the yarn. Similarly you have to choose a pattern and material. Only when choosing material there is now colour matching, minor colour coordinating, pattern matching and material placement. Let's just say it's a good think I had help and guidance on this step - and every single step - of the process! Translation: Any part that is perfect, was probably the part my friend made. What isn't so perfect (like how I went through all of the layers a few times when I was hand stitching the border... Oops!) was done by me. Does this look like an excessive amount of pins to you? It probably would have to me the first block that I quilted... but it was HARD to get the two layers to lay flat enough so that they could be quilted together. The pinning is probably what was the hardest and what took the longest. I backed it in a fleece that was warm and fuzzy, making perfect for the new spouses to curl up under in the winter and watch some tv. ... It also make it fussy to work with. So, to end: Congrats Steph and John! All the best in your life together!! Wow, that looks like so much work! Hand stitching - yikes! But it looks like all the effort was worth it!